The city of Frankfort lies north of Betsie Lake and along Lake Michigan in Benzie County. 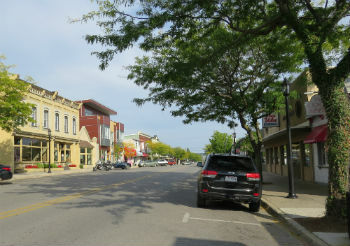 Frankfort is a popular stop along M-22 with a bustling downtown and lake access. Past Frankfort, M-22 continues north around Crystal Lake and up to the Sleeping Bear Dunes National Lakeshore. 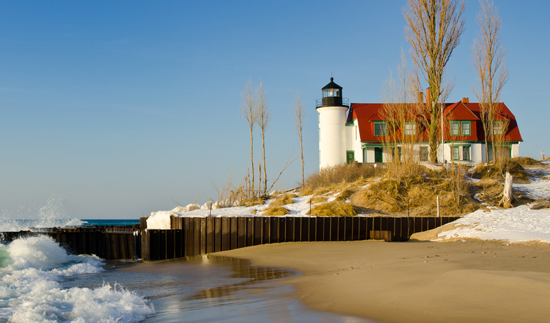 The Point Betsie Lighthouse is a famous landmark in Benzie County and a real attraction for visitors and residents alike. Located five miles north of Frankfort, the lighthouse sits at the southern entrance to the Manitou Passage and was first lit in October 1858. It sits 52 feet above the lake with a range of about 15 miles. The white tower is attached to the lighthouse keepers quarters, with an apartment that can be rented by the week. Downtown Frankfort is home of the Frankfort North Breakwater Lighthouse at the end of Main Stree. The lighthouse, which was built in 1932, features a 67-foot-tall tower that can be seen up close by walking the pier that starts at the Frankfort beach. Joseph Oliver is the first known settler in Frankfort back in 1852. An outside investor by the name of George W. Tifft discovered Aux Becs Scies Lake (now Betsie Lake) and the development of Frankfort began. Most of the early buildings were erected on Main street, Forest Avenue and First-Fourth streets. In 1867, improvements to the Aux Becs Scies harbor began, with up to ten vessels arriving daily. A hotel was built, along with stores and a post office. In 1885, the area officially became a village, and with continued growth, changed that status to City of Frankfort in 1935.